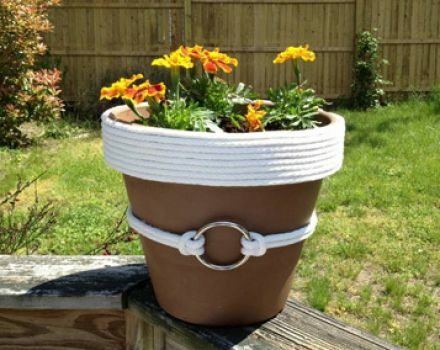 Terra Cotta Pot, white rope, 2-inch metal ring, tape, permanent adhesive glue. Measure and cut 1 piece of rope 23-feet long for the top rim. Measure and cut 2 pieces of rope 26-inches each for the center ring. Wrap rope ends with tape to deter fraying. Add glue to one end of the rope, and place on outside rim of the planter. Continue to add glue onto the planter, then gently press the rope into it. Continue to glue and wrap rope around the planter 8 times (or the height of your rim).